A new space telescope, for launch into low Earth orbit as part of an electro-optical payload for a satellite, was recently designed and assembled by Simera in Somerset West. 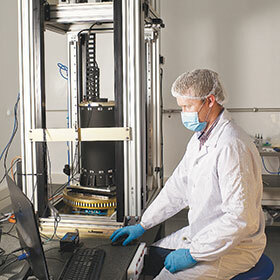 To execute the ultra-precise specifications required for the Simera SX1 Imager’s optical calibration, the company contracted Tectra Automation to design and supply a purpose-built assembly tower to integrate and align the telescope lenses. Requiring a sturdy, highly stable design to mitigate the effects of external vibrations when installing and aligning the lenses, the tower structure was built using the Bosch Rexroth range of heavy duty modular aluminium profiles and accessories. Inside the tower, a vertically translating carriage mechanism was designed to assist with the alignment of optical elements. To achieve absolute control and smooth guidance of this mechanism, Tectra Automation used Bosch Rexroth ball rail system linear guides with pneumatic brakes for maximum rigidity. Four counterbalances positioned at each of the four corners of the carriage were used to maintain optimum positioning control for the 30 kilogram telescope in the assembly process. The pneumatic brakes were controlled by an Aventics panel whilst a linear scale with digital readout provided an accurate indication of the position of the carriage. The tower was mounted on a solid granite table suspended on vibration isolators to isolate the structure from any possible external vibrations. “The design and construction of the optical tower provided the highly accurate and smooth vertically translating carriage Simera required to ensure optimum calibration of the telescope lenses,” said Simera mechanical engineer, Rosca de Waal. Pneumax has joined forces with power electronic engineering technology leaders, Battery Electric, to incorporate a fail-safe design into a uniquely assembled South African product that will ensure safe rail switching in high risk areas. Technology leader Siemens used data from the cities of Lagos, Nairobi and Johannesburg and wove it into unique fabrics which tell a story about each city.